If you’re into boat spotting then this is the beach to be at. You can chill on the white sand while watching the boats sail to and from the pretty harbour of La Savina. It is the closest main beach to the port which affords it far reaching views to Ibiza, and means it is conveniently located, being only a short stroll or bike ride away from the port for day trippers. It usually doesn’t get too busy here and has a restaurant behind the beach which is great for, food, drinks and sheltering from the hot midday sun. The water is nice and clear but may be prone to waves from passing boats from time to time. To get here take the main road from La Savina to Es Pujols past Estany Pudent, and turn left into the carpark a few hundred yards before the Illetes turnoff. Then wander through to the beach on the wooden boardwalk. The beach can also be accessed by foot or bicycle along the dedicated pathway that runs from La Savina. 5.5 km to Cavall d'en Borràs. 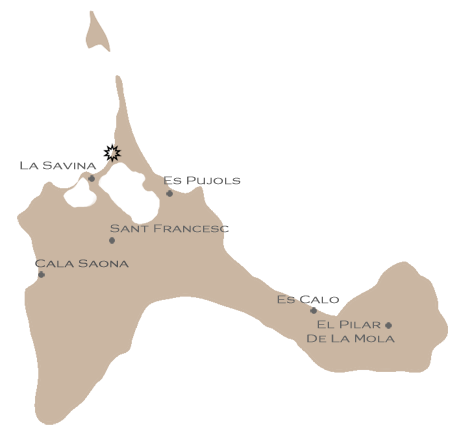 3.5 km to Cavall d'en Borràs. 5 km to Cavall d'en Borràs.